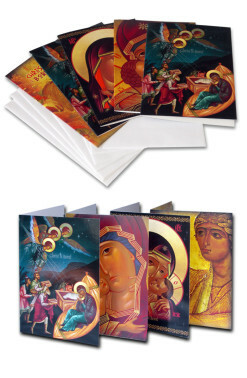 We offer unique Panoramic Eastern Orthodox Christmas cards with images on all sides are sold in sets only. Folded size of each card is 7" by 5". 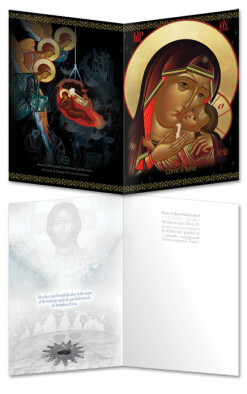 These cards are printed on 100LB card stock with semi-gloss Aqua finish outside and inside. This semi-gloss finish will allow writing messages with ballpoint pens or solvent-based calligraphy pens. Please, note that pens with super-liquid inks, similar to old-fashioned fountain pens, may not work on Aqua finish. Also, Aqua finish will not allow printing over with laser toner or inkjet inks. There are 2 ways to overcome this obstacle. 1. 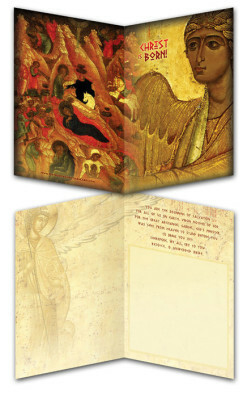 You may print a separate insert with your custom message. 2. You may use our "Golden Light" store hosted by Zazzle for inserting your message anywhere and customizing other details. 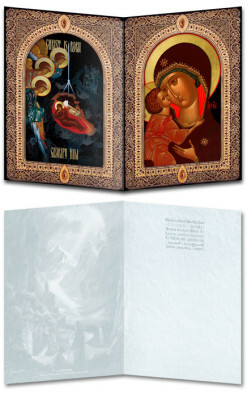 From 2019 we will be offering only 1,000 cards sets for sale. Smaller quantities will be still available from our "Golden Light" store. 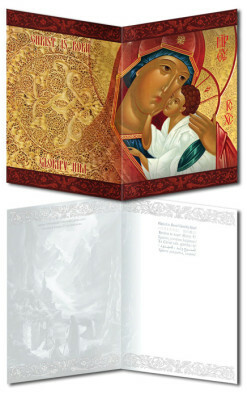 Traditional Orthodox Christmas greeting “Christ is Born! 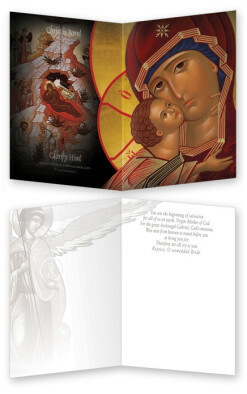 Glorify Him!” is featured in seven languages inside of the several cards designs: English, Japanese, Romanian, Greek, French, Arabic, and Slavonic. 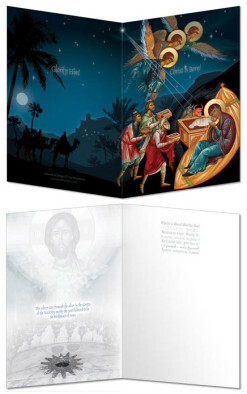 On the left inside of greeting cards is either a picture of 14-pointed silver star underneath the Altar of the Nativity that marks the place inside The Church of the Nativity in Bethlehem where Jesus was born or images of Nativity scenes. 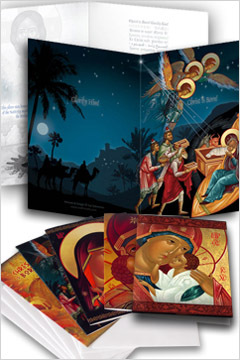 If you wish to order customizable Christmas cards in smaller quantities, please, visit our "Golden Light" store hosted by Zazzle.